When John Betjeman addressed the Solent Protection Society in the days before construction began on Fawley Power Station (1964-71, Farmer and Dark) he spoke of the “new architecture of power”. At Fawley, he argued, the plans would bring a “brooding presence” to dominate a gentle, small-scale landscape that was unable to receive it. Looking at Fawley fifty years later, he may well have been right. Its enormous chimney towers over the flatness of the New Forest and the sheltered waters of the Solent. It’s well-used as a navigational aid in those busy shipping lanes and it’s a landmark visible across the south coast. Even walking along a ridge on the South Downs, miles inland, I’ve found myself looking over and spotting the silhouette of Fawley jutting up in the haze. 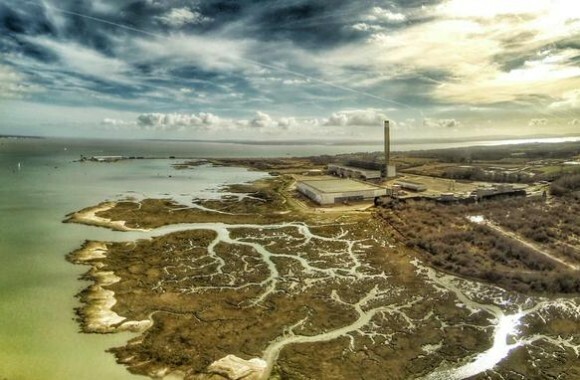 Fawley was the fifth of thirteen huge power stations commissioned by the Central Electricity Generating Board (CEGB) in the late 1960s. This vast expansion of generating power spread across semi-rural England demonstrating the pinnacle of nationalised industry in England. For Fawley, the CEGB brought in Farmer and Dark, a specialised firm no strangers to creating enormous turbine halls and monumental towers. Fawley’s hall is a long, straight-sided box with its roof in twenty sections, mostly of corrugated aluminium sheeting. What adjoins alongside is the real star of the show: a central core rising between the boiler house and the switch house, and higher than both. The walls are a close zig-zag of glass, formed into adjacent triangular columns rising until, just below the flat roof, they taper between inverse columns slotting downwards. 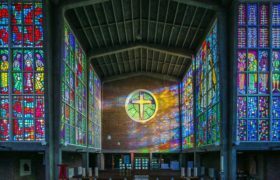 The thick marine-grade glass gives a translucent, crystalline effect. During the day you can see the fuzzy shapes of the industrial plant; at night sodium floodlights illuminate it from within. The dominating bulk was lessened from the start by an attempt to negate the station’s environmental impact: the buildings sit in a trench twenty-four feet below sea level. This means that, although the tower is visually inescapable, rising up over the New Forest, the main buildings lie quite low on the land. The complex is only seen fully from the water – ideally from the decks of the Isle of Wight ferry – or from immediately down the coast. From Calshot, the glazed gallery catches the sun and gives the whole structure a lightness and luminosity that you might not associate with generating power by burning fuel oil. Construction at Fawley took place from 1965 until 1971. The site presented an enormous number of difficulties, which were heroically overcome by swarms of civil engineers and construction workers. Despite its gargantuan size, one of the most impressive feats of engineering lies below the surface of Southampton Water, a two-mile-long tunnel built to take high voltage electric cables across the water without the need for pylons. While luxury liners sailed in and out of Southampton’s docks overhead, just thirty-three feet below the sea floor a motley crew of Irishmen and Scots were “bent nearly double and pouring with sweat, grimly tunnelling their way through the earth below the sea bed”, the Southern Daily Echo was shocked by the ‘mole man’ wage of £100 a week but thought they were “worth every penny”. Before entering the tunnel workers had to sit in a decompression chamber, which adjusted them for the high-pressure conditions of working below the seabed. The tunnel was ten feet wide and carried a small electric railway for removing the sodden clay that was being dug out. It was on an overnight shift in October 1965 that workmen from both sides of the water met in the middle. On the breakthrough there was a polite handshake but no champagne – “Alcohol”, we are told, “is strictly barred in the double atmospheric pressure”. The men are reported to have clocked off at 7am and headed straight home to bed. Nearby, at Marchwood, the same architects had built an earlier plant. 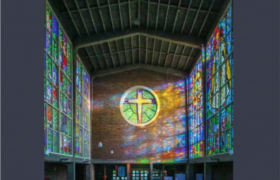 Its was described as “a precise statement of envelope” in The New Architecture of Europe. This mid-century ‘architecture of power’ was not only demonstrated in the utilitarian boiler houses and turbine halls but in the pride and care given to the smaller buildings. Marchwood is long gone but English Heritage recently considered the ancillary buildings at Fawley for listing, on account of their quality and inventiveness. 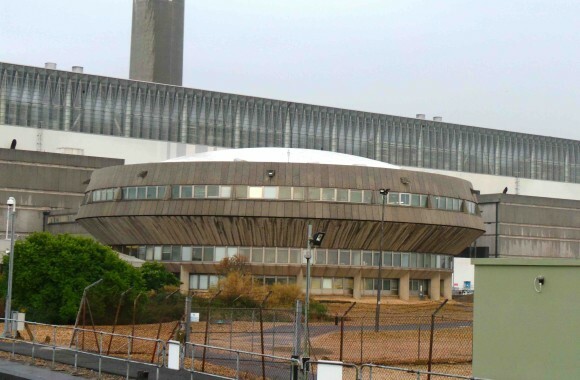 The main control room at Fawley is one of these astounding ancillary buildings. Completely unlike the Bauhaus glass of the turbine hall behind it, the ‘Tracy Island industrial’ control room was dubbed “The Flying Saucer” by the press because that is exactly what it looks like: an aluminium-domed concrete drum, connected by a bridge to the turbine hall and hovering on concrete piers, looking like Thunderbird 2 might drop out at any moment. The interior is no less futuristic with its curving walls, stacked up with dials, controls and flickering screens broken up by a strip of windows giving almost 360 degree views of Southampton Water. The ceiling lights radiate from the central pillar, spiral staircases take you down to the lobby, detailed in teak and polished concrete. Viewers of Channel Four’s comedy Green Wing will have seen the building’s surreal appeal in a dream sequence with the cast transplanted, in silver suits and Barbarella wigs, to a retro-futuristic command centre. It was a location scout’s dream: apart from the replacement of the original four computers, not much appears to have changed since 1965. 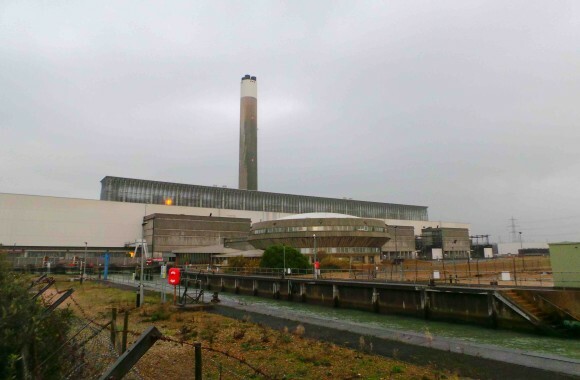 The English Heritage report remarks on the building’s interior completeness and, despite mothballing Fawley in 2013, RWE are still using this to control a number of power stations across the south. Alongside the control room is a narrow, concrete dock which can accommodate and oil tanker should the enormous Esso refinery next-door be unable to supply the station, it also provides seawater to be pumped around the turbines to cool them. The canteen building projects over the dock, four triangular sections in laminated Douglas fir, which house the dining room, changing facilities and kitchens. With large wooden-framed windows below a dynamic, interlocking sail design for the roof, the design is distinctly different from the Brutalist-influenced control room. It feels much more of-our-time, like a newly-opened pavilion in a Danish park, not a canteen for industrial workers in 60s Hampshire. Fawley’s 650ft (198m) high tower has become an accidental landmark. For all our desperate attempts to create iconic structures and lasting monuments to placemaking, Fawley has managed it without even trying. The chimney is as tall as the Post Office tower in London, visible across the Solent, an aid for shipping in one of the busiest shipping lanes in the world and the subject of a charming children’s book about the hawks that nest on its apex (Top Gun of the Sky by Martin Bradley). No apartment block or monumental sculpture along Southampton’s ‘regenerating’ waterfront could hope to emulate the place that Fawley has in the collective memory of south Hampshire’s residents. In its main function it’s been a pretty spectacular failure. It went online just a few years before the 1970s oil crisis and has never been used to full capacity, meaning that its tower is, fortunately, remembered more as a benign presence than for belching out black smoke. In 1973 it was listed as the UK’s most efficient power station; by 1992 it was one of the dirtiest. English Heritage made the administrative buildings exempt from listing in 2013 and plans are currently in the works for the entire plant to be demolished and re-built as a gas turbine power station. Adam Smith is a writer and philosophy student. He collates interesting things at http://commonorgarden.tumblr.com and tweets @nfkadam.